Bologna is the capital and largest city in the Region of Emilia-Romagna. It has a population of nearly 400,000 and is situated on the edge of the Po Plain at the foot of the Apennine Mountains. Bologna station, Bologna Centrale, was built in 1864. It has changed little since then but a new station on two levels is being constructed – a modern gateway to Italy’s sixth largest city. Bologna lies on the main line, now a ‘Directisima’ or NBS, between Milan and Rome. There are two lines converging from the north: One from Innsbruck – the Brenner via Verona - and from Klagenfurt via Venice and Padua. 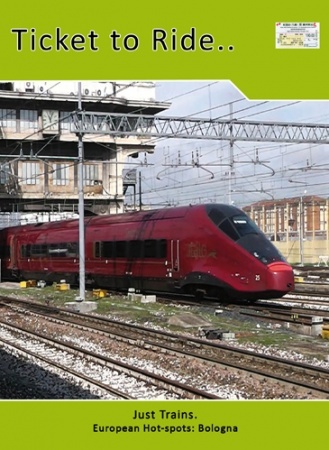 In addition to ETR500 trains from the state operator we see AGV high-speed train-sets “Italo” built by Alstom. These are operated by Nuovo Trasporto Viaggiatori or NTV. FS has been busy re-branding many fast services: Frecciabianca is a new category introduced by FS In December 2011. The passenger cars are the Grand Comfort stock of the late 1970s but heavily refurbished and repainted. Traction is from a fleet of refurbished E402B machines topped or tailed with a driving trailer. Medium distance local services utilise double deck EMUs from “TAF” which are also used by OAO Trenord on the Milan airport (Malpensa) shuttle. RT 42mins.